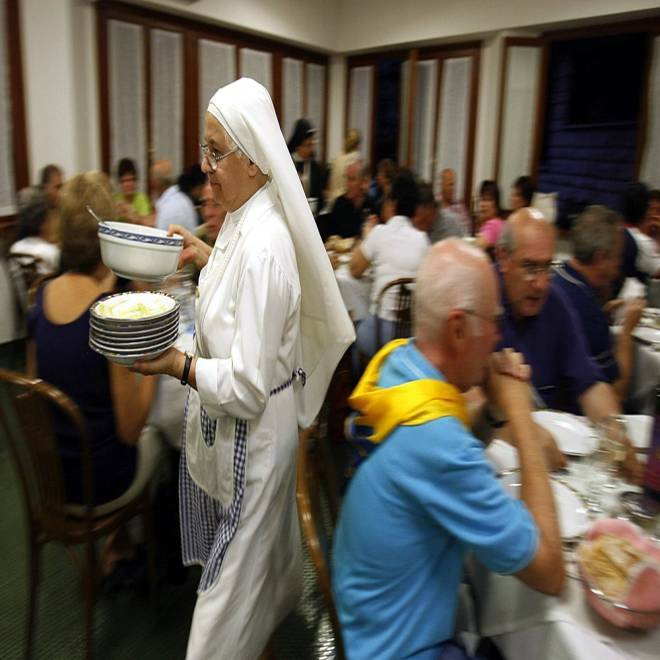 Sister Martina clears dishes during dinner for pilgrims in Casa Mater Mundi, an 88-bed hotel in Rome. Motherly inkeepers, spick-and-span bathrooms, some of the cheapest room rates in town, plus an ambiance of spirituality more than compensate for any inconvenience, say many travelers. Travelers can find cozy, convenient lodging for $50, $20 or even free in virtually every destination -- as long as they know where to look. Aside from airfare, lodging is typically the expense that takes the biggest bite out of a vacation budget. But there's no need to rack up hotel stays for $100 to $200 a night or more. Creative travelers who are willing to consider alternatives to hotels could pay a fraction of that price -- or nothing at all. Below, we review 10 options and evaluate the pros and cons of each. See if these affordable alternatives to hotels are something you'll dig or want to dump. This is a relatively new trend in the travel world -- a cross between vacation rentals and homestays. Using websites like Airbnb.com and iStopOver.com, travelers can rent a room in someone's house, a cottage or a private studio apartment for low nightly rates (it's not uncommon to see prices under $50 per night). It's a way for hosts to open up their homes and make a little extra money, while giving travelers a great deal and a local's-eye view of a destination. Dig it: Do you love a chance to meet people, see how they live, maybe play a midnight game of Scrabble or Call of Duty? Although you may score a cottage all by yourself, it's more likely you'll get a small bedroom and share a bath. If that's cool with you, a short-term room rental is your thing. If you're not quite that flexible, you can still dig these digs. iStopOver.com allows you to make what they call a Wise Ask, a list of your requirements that allows "hosts" in the city to bid on your business. Dump it: If uncertainly keeps you awake at night, you may sleep better at a chain hotel. Depending on where you're traveling, there may be affordable lodging offered by religious organizations -- such as convents and monasteries in Italy (see MonasteryStays.com), or Christian or Jewish guesthouses in Jerusalem. An Internet search or a visit to the local tourist board's website can help you find these options. Dig it: If you long to be welcomed with no judgment and no questions into a calm, clean environment -- perhaps even have a private bathroom, as MonasteryStays.com promises -- religious housing is for you. Many even welcome children with open arms, often having larger rooms set aside for families. Dump it: Your room will be clean and functional. If you want luxury, look elsewhere. Same goes if your kids are hellions, accustomed to running up and down halls screaming at the top of their lungs. Also, if you're a late-owl who likes to party into the wee hours, chances are you'll miss curfew and be locked out. Though they're commonly known as "youth" hostels, this form of accommodation can be ideal for budget travelers of any age. Even if you're not up for the cheapest option -- a bed in a shared dorm -- you can often get a basic private room at a hostel for significantly less than the cost of a low-end hotel. Dig it: Hostels are perfect for the unscheduled traveler or backpacker, and for those who like an adventure -- read: those who don't mind plenty of company. Dump it: Some hostels can be sketchy -- lacking not only privacy, but also safety. Consider checking on sites such as Hostels.com or HostelWorld.com for reviews and recommendations. Or see if the property is a member of Hostelling International, a U.K.-based non-profit organization with more than 4,000 members worldwide that meet a minimum standard of cleanliness and safety. Sleeping in someone's spare bedroom or on the living room couch is by far one of the cheapest ways to travel. In many cases, it's free, and it's also a great way to meet locals. You can organize a homestay through long-established hospitality networks like Servas International, or check out newer sites like CouchSurfing.com. For more information, see our guide to Homestays and Farmstays. Dig it: If "life is an adventure" is your motto, this mode of traveling is for you. You stand the chance of meeting interesting people and getting a close-up look at local life. If you're social and socially conscious, Servas, an accredited NGO that encourages members to get involved in their host's communities, could be for you. Just super-social? Go with a CouchSurfing.com-type option. Dump it: You must be trusting and trustworthy, flexible and friendly for homestays to be an appropriate choice for you. You also have to be patient -- the Servas interview process takes at least four weeks, probably longer. As a Servas traveler, you'll also have to write a travel report when you return. CouchSurfing.com is looser and much more in touch with social media -- providing plenty of opportunities to connect with locals and other travelers. If you go it on your own through word of mouth, use caution. A Paris apartment, a villa in the Caribbean, a log cabin in Vermont ... vacation rentals offer unique and affordable lodging around the globe. Because they tend to be more spacious than hotel rooms, they're a particularly good bargain for families and groups who can divvy up the cost. And having your own kitchen can save you big bucks on restaurants. Learn more in Vacation Rentals: Right for You? Dig it: The many options in vacation rentals means this choice is great for a variety of trips. If you appreciate the convenience and savings of having kitchen -- even laundry -- access during your trip, a vacation rental is for you. And if you're traveling with a group of friends or family, having everyone gathered in one home can be priceless. Dump it: If there's going to be a fight over who gets the master suite, avoid holiday havoc by checking the floorplan of your rental and deciding ahead of time who gets which room. A rental agreement is a binding contract, so if there's a chance your vacation plans may change, stick with a hotel. When students go home for the summer, many colleges and universities open their dorms to visitors. Expect basic but very affordable accommodations (bathrooms may be down the hall, for example). There are few central databases of this type of lodging -- University-Rooms.com is one to try -- but it's worth calling a few local campuses directly to see if anything might be available during your trip. The local tourist board may also be able to help. Dig it: Restaurants, bars and entertainment venues often surround college campuses, so there should be plenty of action nearby. Dump it: Most college kids are hard on their dormitories and rising tuitions costs means not much is being invested in new carpets, furniture or finishings. Elevators and air-conditioning are uncommon in older buildings, too. From rural B&B's to working ranches and cattle farms, this type of stay can cover a wide range of accommodations -- and you don't necessarily have to be willing to milk a cow to take advantage of it. Farmstays are particularly popular in Europe, Australia and New Zealand. Learn more in Homestays and Farmstays. Dig it: If you enjoy waking with the sun to feed a bottle to a lamb or corn meal to chickens, a farmstay may be right for you. You may be treated to a hearty breakfast, learn to make cheese or spin wool. The quiet, bucolic setting is perfect for relaxation, catching up on reading or finishing handicraft projects. Dump it: It can get very quiet, especially in the evening -- so if you're a night owl, your only companions may be the mice. The type of lodging can vary widely -- although if you're traveling in Europe or Down Under you'll have more choice than in the U.S. If you need to know exactly what you're getting, this isn't for you. Sleeping under the stars can be a magical experience -- and it's one of the cheapest options on our list, especially if you cook your own meals over a campfire instead of eating in restaurants every night. And don't worry ... you can opt for cabins or luxury tent camps if you'd rather not be slapping mosquitoes away all night. Get inspired with our Top Seven Spots for a Camping Trip. Dig it: If you long to disconnect from electronics, go camping. A campfire beneath the night sky can be relaxing and mesmerizing -- you won't miss your TV or tablet. And you can't beat a perfectly toasted marshmallow as a bedtime snack. Dump it: Cooking a meal over a campstove or fire, washing dishes in a bucket, waking up to rain-soaked sleeping bags -- if giving up conveniences isn't worth star-gazing, forget camping. And if being clean and sweet smelling is important to you, don't camp. Bed and breakfasts can often save you money over hotel rooms, especially if you're willing to use a bathroom down the hall. And it may be less inconvenient than you think: Sometimes the room you're supposed to share a bathroom with might not even be booked -- giving you the facilities all to yourself. Dig it: The coziness and camaraderie of a B&B is appealing to many travelers -- enough so to overlook the possibility of having to share a bathroom. You'll save not only on accommodations, but also on meals since breakfast is covered. Dump it: B&B's, especially those with shared bathrooms, may lack other modern amenities, such as flat-screen televisions, multiple outlets for charging electronics and even Wi-Fi. Swapping houses with another traveler is an ideal way to enjoy the comforts of home while traveling -- and it's practically free. To become a member of a home exchange network, you'll typically pay an annual fee that costs about as much as a night in a hotel room, so after the first couple of nights of your vacation, your membership has paid for itself and then some. Learn more in Home Exchange: A How-To Guide. Dig it: All the conveniences of home -- kitchen with all the gadgets, laundry with detergent, Wi-Fi -- and usually away from tourist traps and traffic, too. What's not to love? Dump it: There's always a chance something might happen -- power outage, burst pipe, the homeowner's angry ex banging on the door at 3 a.m. -- and there's no one around to take responsibility except you. Home exchange isn't for the worried traveler: Will I break something? Will they trash my house? Am I safe in their home? Is my grandmother's china safe in my home? If these concerns keep you up at night, sleep in a hotel. Poll: What's your least favorite thing about staying in hotels?